We photographers have a bit of a love/hate relationship with movement. Sometimes it’s a real pain and we strive to keep it to a minimum. At other times, we want to celebrate it in all its blurry glory. The motion of traffic at night definitely falls into the latter category. By using a long exposure in the low evening light, the smooth motion of their lights creates wonderful streaks of colour through the frame. This is one of those camera skills that reveals the magic of photography – and the best part is, it’s easy! Anyone with a DSLR and tripod can do it. As such, it’s a great way to get started with long-exposure photography as there’s no need for extra filters or even a cable release. If you find you usually stick to the auto exposure modes, a project like this offers a gentle introduction to Manual exposure mode. 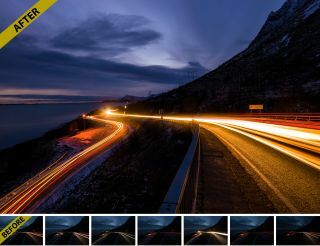 In order to get the long shutter speeds we need, we have to adjust our other exposure settings to compensate. Firstly we can use a high f-number like f/16. This decreases the size of the opening in the lens and restricts the flow of light. Secondly, we can use a low sensitivity, such as ISO100, so the sensor requires more light for a correct exposure. Both of these factors help to restrict the amount of light, which means we can use a longer shutter speed. Rather than shooting in pitch dark, try just after sunset so there’s still detail in the sky. Even so, autofocus can struggle to lock on in low light, so focus on a point a third of the way into the scene and then switch to manual focus to lock it. This’ll prevent hunting between frames. Shoot plenty of frames as vehicles zoom by. Differences in height make the trails more varied (as will flashing lights, which appear as dashes). Take care not to nudge the camera between shots, as we need all the frames to be in alignment if we intend to blend them together. Open all the images you want to use (we blended seven) in Photoshop. Choose one frame as the base image, then go to another image, Select All (Cmd/Ctrl+A), Copy (Cmd/Ctrl+C) then go back to the base image and Paste (Cmd/Ctrl+V). Repeat for all the other images. Go to the Layers panel (Window>Layers) then change the blending mode of all layers to Lighten, which effectively lets us overlay the trails on top of one another. If any other areas, like the sky, look messy, use a layer mask or the eraser to remove them from the mix.